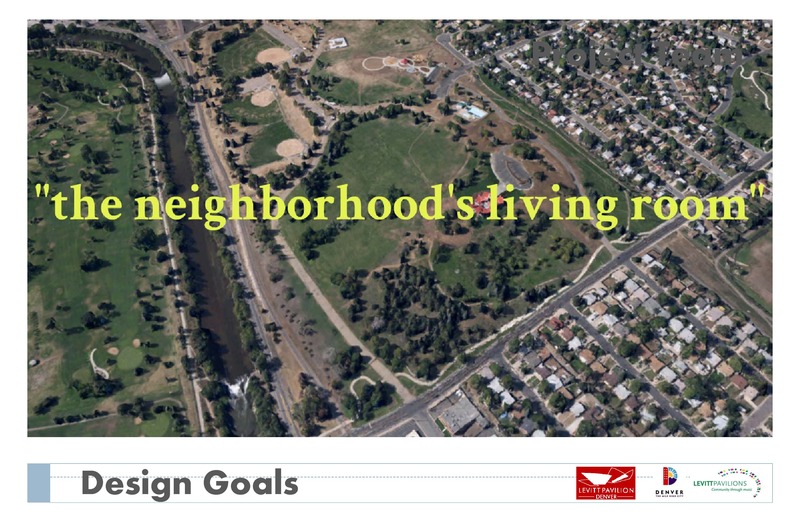 Note: This meeting was initially called the Southwest Denver Neighborhoods Meeting since the Ruby Hill-Godsman Neighborhood Association’s invitees included the associations of nine nearby neighborhoods that may be interested in the upcoming Levitt Pavilion at Ruby Hill Park. 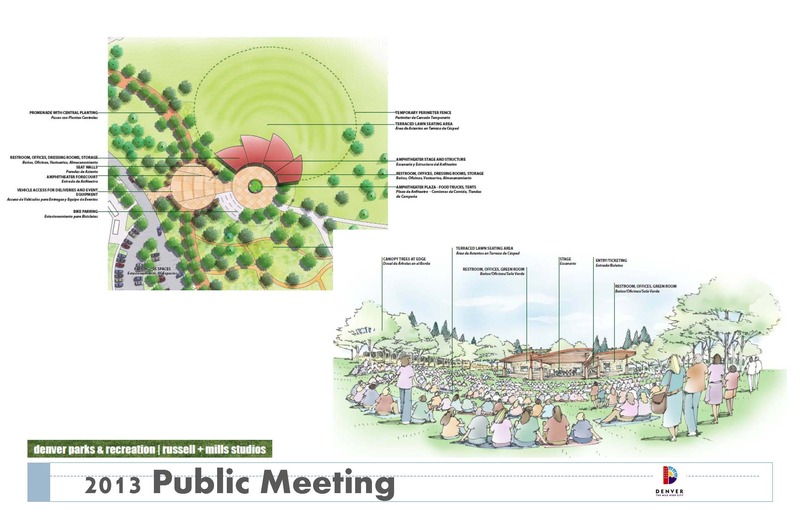 However, Levitt Denver and Denver Parks and Recreation are calling it the first of at least two Public Meetings that will be held prior to construction beginning this fall. For speakers requesting corrections to any of the below information, or for neighbors requesting more information, please use our contact form. Scott Bolt began with introductions and a brief history of the project going back several years ago, thanking former neighbor Chris Gibson for all the work put in during those initial planning stages. Scott introduced District 7 Councilman Jolon Clark, who spoke briefly, encouraging feedback on the project and on any other concerns neighbors might have in the district. Started in 2008-2009 gathering feedback. The master plan is result of that input. 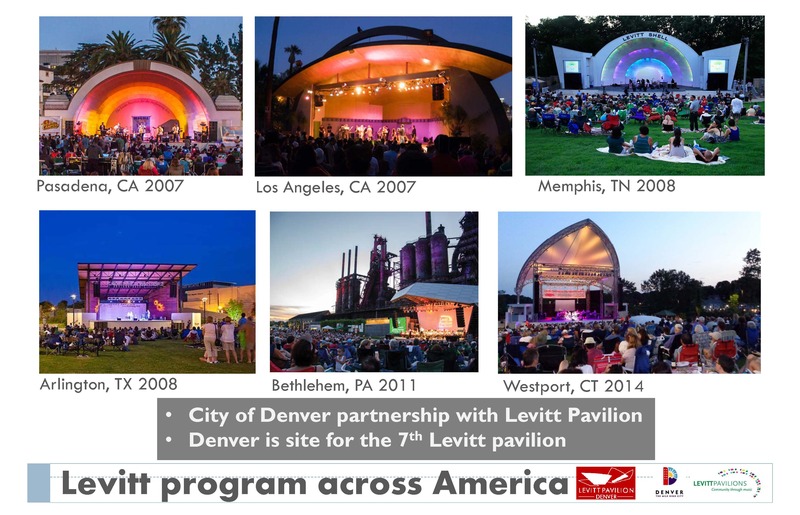 Chris Zacher, the founder and Executive Director of Friends of Levitt Denver talked about his involvement and experience with City Park Jazz and Levitt’s goal of trying to build a sense of community that engages families, musicians, etc. 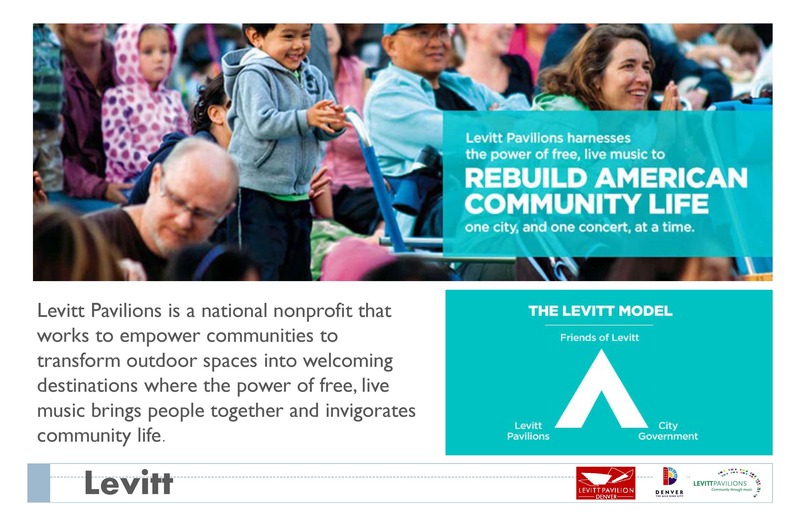 Levitt’s goal is to have 30 venues nationwide by 2035. 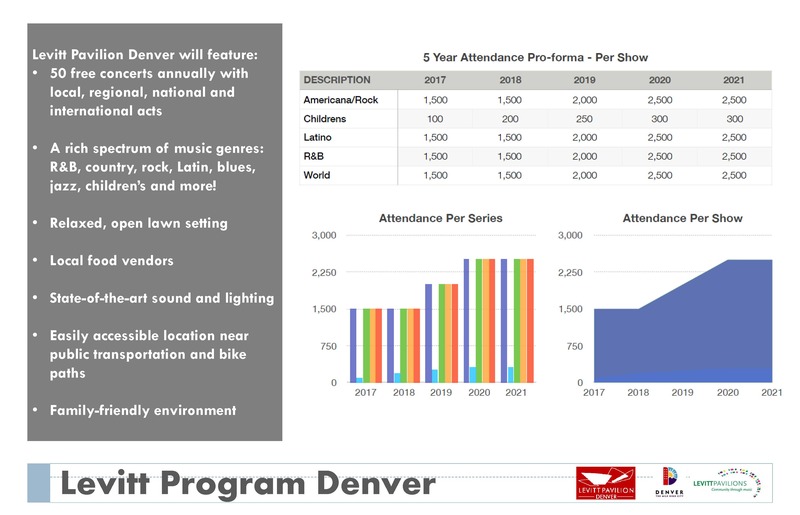 They focus on family entertainment and are the largest provider of free concerts in the U.S.
Mr. Zacher is looking to start a community advisory sub-committee for input and communication. Contact him if you are interested in being a part of it. 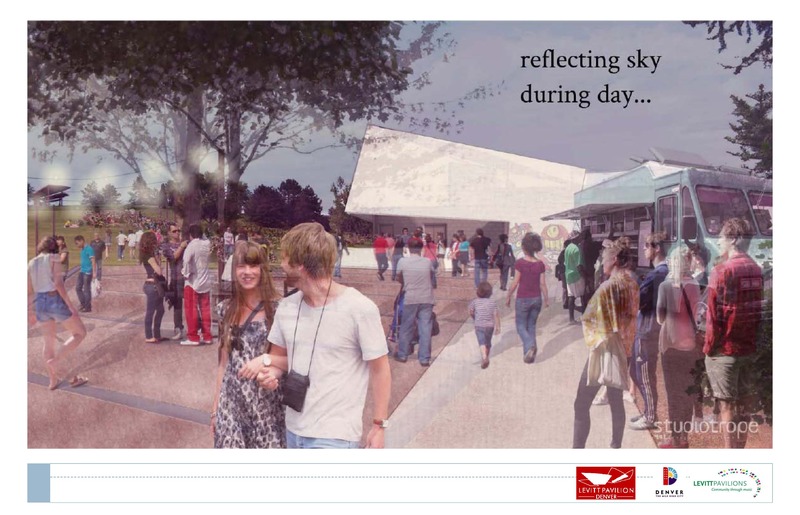 They expect 1,500 patrons for concerts the first few years. 2,000-2,500 patrons per show on Friday/Saturday after the first few years. Admission-based events: cap of 3,500-4,000. Mr. Zacher stressed that doesn’t mean there will be that many people at these shows. They will be looking at parking, infrastructure. Not more than ten admissions-based shows per year in the beginning, probably closer to four to five. 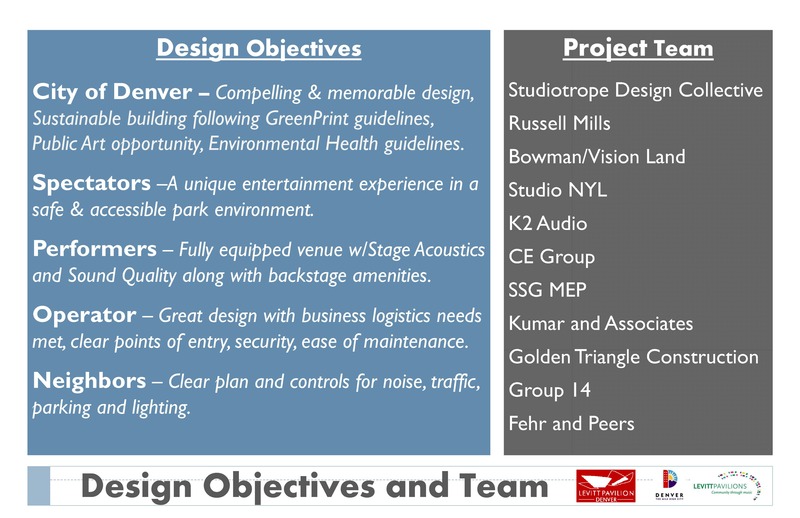 Rohini Saksena, Senior Architect with Denver Public Works spoke about the design objectives for the amphitheater. See slides below. 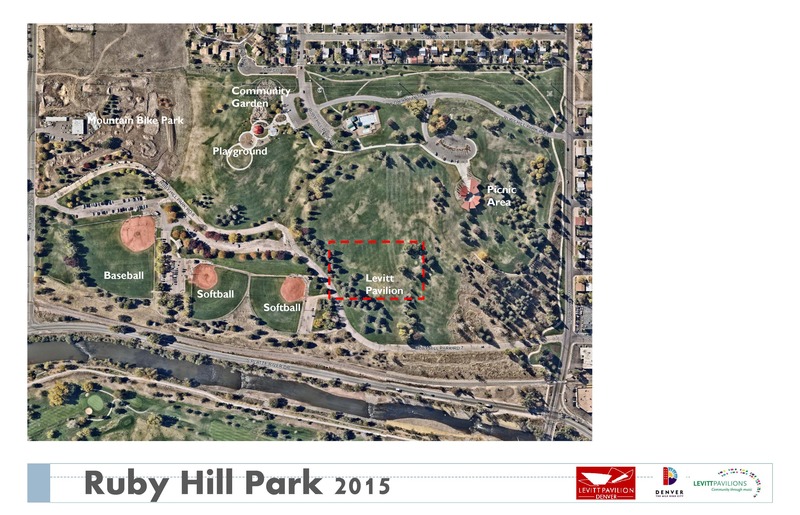 Showed a surprising slide that compares Red Rocks amphitheater’s size to the natural bowl at Ruby Hill Park. See slides below. Talked about the concert-going experience of Red Rocks versus the park concert experience they want to create at Levitt. Red Rocks: crammed in close together, all there for the purpose of seeing a concert. 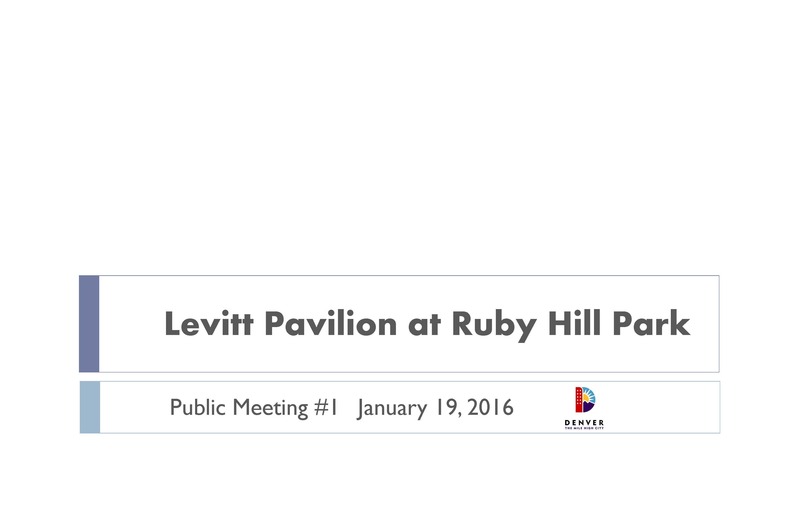 Levitt at Ruby Hill: may be there for other park amenities and music just happens to be going on. People on the hill with blankets, lots of space, playing frisbee, drinking 3.2 ABV beer, enjoying the music. 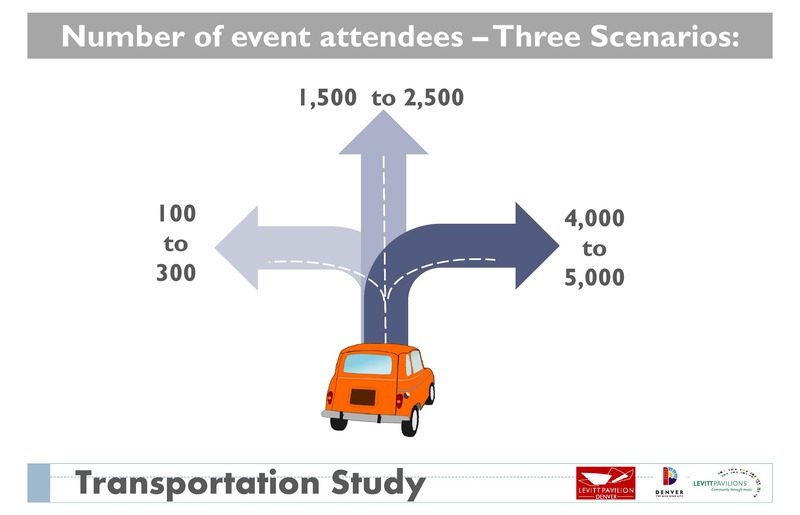 They will be doing a transportation study with three scenarios: 100-300 attendees; 1,500 to 2,500 attendees; and 4,000 to 5,000 attendees. 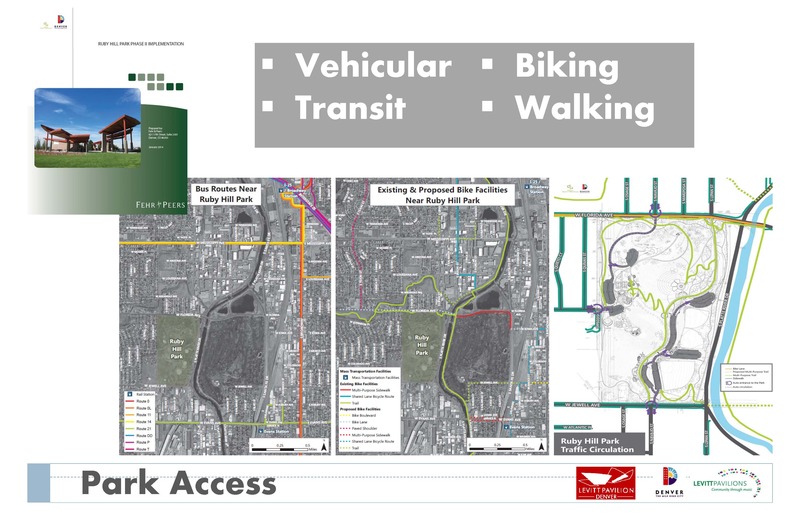 The study will consider different options: bike valet, traffic control, off-site parking with shuttles. Consideration will be given to signage and way-finding so people won’t be circling the neighborhood looking for parking. Talked about making information available on websites. Interested in knowing what specifics the neighborhoods want them to look at with a detailed study. Ms. Saksena came back to speak about the timeline for the next year. They are currently looking to bring a construction manager/general contractor on board through an RFP. A second public meeting will be held this spring. 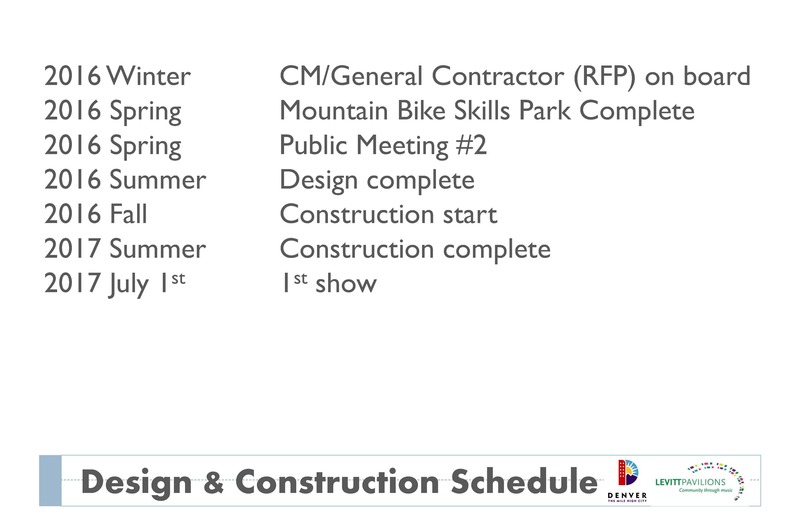 Design will be complete this summer and construction is scheduled to start this fall. The first show is scheduled for July 1st, 2017. 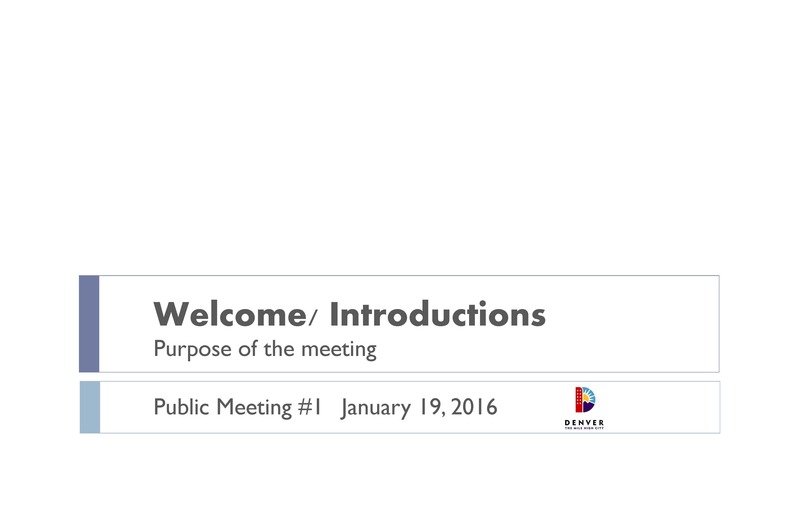 Slides from the presentation are shown below. Thank you to Rohini Saksena of Denver Public Works for sharing them. Concern: Currently, there are not enough bathrooms. Not enough at the baseball fields, no bathrooms by the playground. Currently restrooms aren’t open in winter. 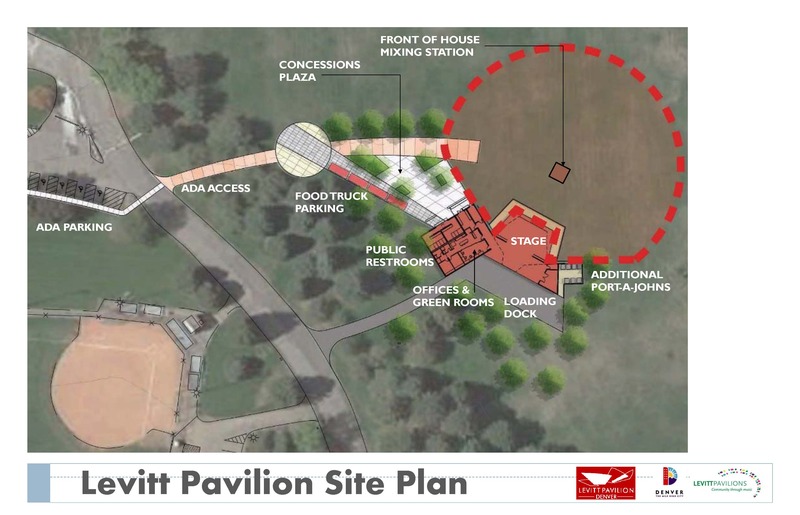 We need bathrooms now, not just when the amphitheater opens. There are also no recycling bins. Response by Mr. Robertson: Will pass that on to the Director of Operations; Wash Park and City Park have recycling bins and they should be available at Ruby Hill as well. We will discuss on more and regular bin availability. The new restrooms will be available all year round. Concern: Concerned about graffiti. Response by Ms. Saksena: Graffiti is a huge design consideration, we will be looking into design and remediation aspects, and you will start to see solutions at the next public meeting. Concern: Need for bike lanes north-south connecting across Mississippi, which is dangerous. Response by Mr. Robertson: The long term goal is to have a bridge in place. Also would like to add bike-friendly crossings at Florida, Mississippi, and Lipan to our to-do items. Officer Blakesley spoke briefly about safety. “We’re going to do what we always do: keep it safe so everyone can enjoy the park and venue.” The department will be aware of larger events, but the venue is responsible for hiring private security. Mr. Zacher stepped in: private security is a mix of off-duty DPD officers and private security. Venue security will not pull from on-duty officers. Concern: With all the current street racing that happens – “how you always do” may not be enough. Response from Officer Blakesley: we’re aware of street racing, but at times we don’t have enough resources. Often there are higher priority calls. Neighbor: there needs to be someone coordinating with the police department in planning. Response by Councilman Clark: we are committed to getting more resources and to proactive planning. City Council pushed for an amendment for an extra $1.5 million to add police resources. We are instituting a 4 year plan so this isn’t a budget issue every year. Recruiting and training takes time and there will be a lag time before those resources are in place. By 2017 when this opens, staffing level should be different than now. Response by Mr. Robertson: from a park planning perspective – he has heard stories about City Park and Wash Park from many decades ago. Since then, with lots of planning, investment, etc. at those parks, now they are safe. Transforming a park is part of the solution as well. Look for increased ranger activity as well. Concern: Decibel levels? Response by Mr. Robertson: the decibel level has to be 55 at the closest residence. 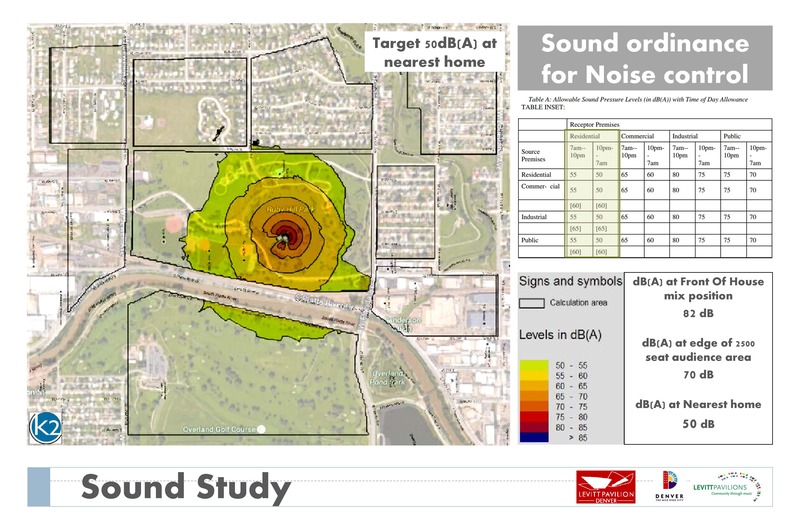 Sound studies that have been done show the decibel level at the top of the park before the first house is 55 dB. Because of the way the bowl is shaped, most of the sound will be absorbed by the bowl. There is a 10 pm curfew at this park. Concerts will start at 7, and be over at about 9 to get everyone out of the park by 10 pm. Question: Where are the bands coming from? Response by Mr. Zacher: 25 will be colorado-based musicians. The other 25 will be nationally emerging artists. Bands have to be at a certain level to play a facility like this. The goal is on a Friday night, you would say to yourself, “I’ll go to Levitt because I know it will be good music”. Question: Will there be room for the Colorado Symphony? 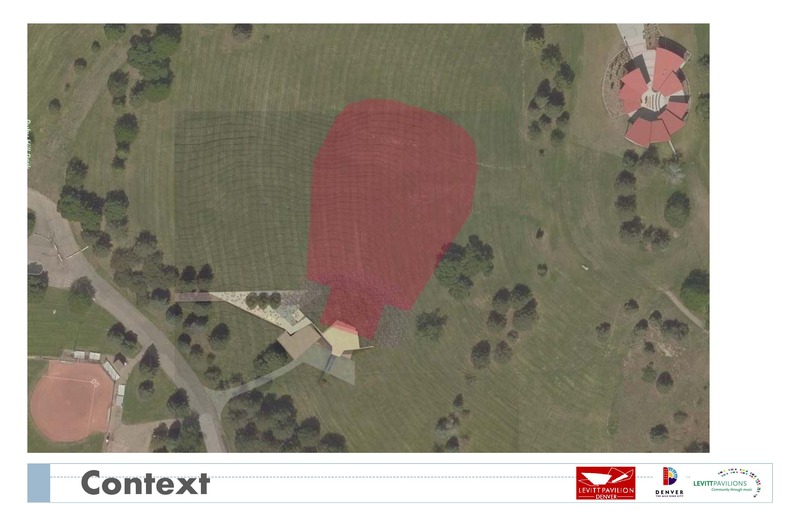 Response by Mr. Zacher: Yes, the stage is 70 feet wide at the back, 30 feet deep, and 50 feet wide at front, so it is big enough to accommodate them. They are in discussion with CSO to have a Pops series there. Question: There’s been a request to do some partnership with RTD to bring a bus up Florida from the light rail stations, but curious what kind of networking have they done with RTD. Response by Ms. Saksena: that discussion has started, but not born fruit yet; they are looking at diverting from Evans station to Jewell, but still working on it. Question: Can there be movies in the park? Response by Mr. Zacher: yes, the vertical surface of the stage is projectable. The building is a community asset: the first and only free cultural facility in Denver and on the west side. Levitt won’t be the only organization utilizing it. They hope to have Shakespeare in the Park, the Denver Film Society, etc. hold events. It will be available to book for weddings, non-profits; the facility will be available for permit. There will still only be a limited amount of admission-based events (3-4 a month). Scott: Swallow Hill is interested, as is the Greenway Foundation. Issue: Neighbor representing the independent variety non-musical artists – clowns, stilt-walkers, balloon artists. 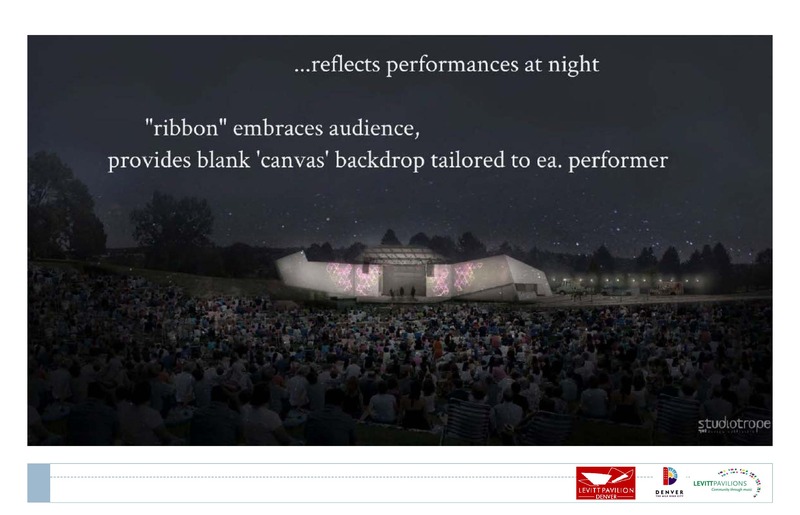 “Keep us in mind to establish the family-friendly vibe.” Response by Mr. Zacher: absolutely – providing an outlet for the arts is part of our mission. Concern: the Iowa viaduct connecting platt park is dangerous. Mississippi is not much better. Are there plans to improve the Iowa viaduct? Response by Mr. Robertson: We have a bike planning person and that is her #1 project. Looking at Tiger Grant, and that is one of our top projects we’re looking for funding for. It will have to be Federal funding. Concern: what is the feasibility of getting people from the light rail station over to the park; maybe a B-cycle station? 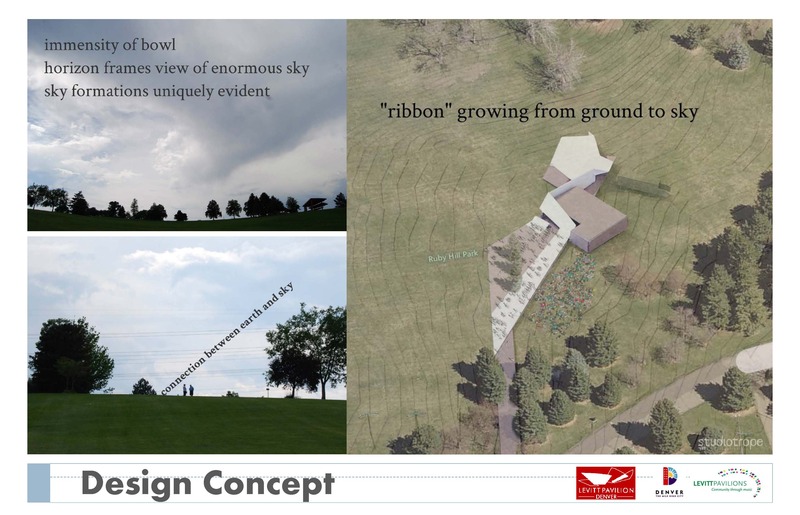 Response by Mr. Bouchard: We’d love to have a B-cycle station in the park; when you build things like this, all the sudden more funding becomes available for other things, especially when it’s activated and used. Response by Mr. Robertson: There are a couple different things in play. One is a bridge at Mississippi; that’s part of the Broadway Station Development. The Greenway Foundation is looking at connections at Jewell. Also looking at a jetty in the river at Jewell but when bridge goes in you’ll be able to park. It comes down to funding and a long term plan. There’s a possibility of simplifying Platte River Drive where it splits to create a space to do a crossing. Question: is a parking garage being considered? Response by Ms. Saksena: it’s too difficult to put a parking garage in the park. We are looking at on ground parking. 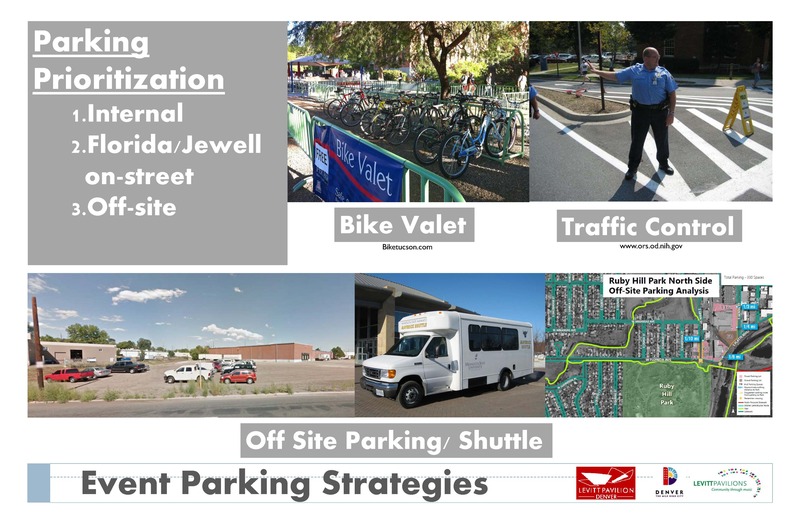 Response by Sharona: in networking with Colorado Public Radio, they are looking at the feasibility of putting their HQ off Jewell and one thing they offered was to have 100 parking spots available to people who are utilizing the park for concerts. Question: if there isn’t enough parking, are they going to be allowed to park in the neighborhood? Like at the stadium—if you don’t live there, you aren’t allowed to park?Response by Ms. Saksena: the transportation study will help them determine how much parking they can accommodate. They will learn what they can fit and start discussing with the neighborhood the results. 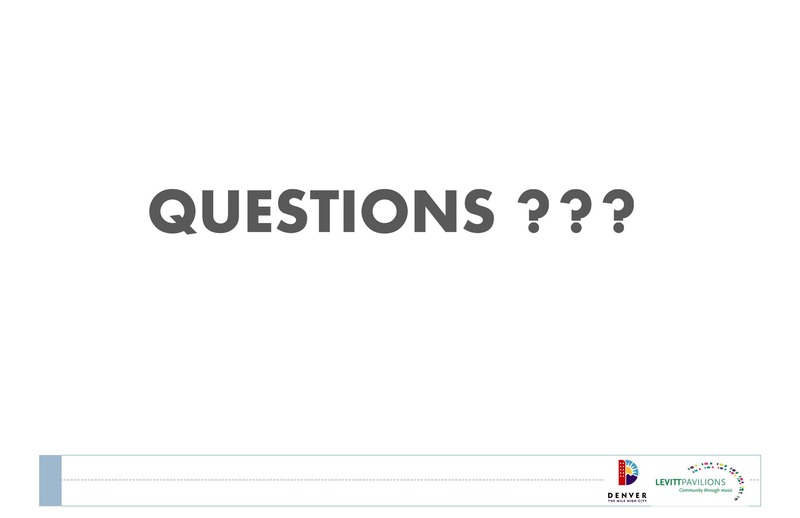 Question from Sharona: regarding feedback: how can we keep the dialog going once things have started? If neighbors experience parking issues or sound issues, what can they do? Response by Mr. Zacher: through our Community Advisory Board. There is feedback that happens between us and the City. It’s premature to assume there’s going to be an issue until we figure out exactly what it’s going to look like – how a Thursday concert vs. a Saturday concert will differ. We have people looking at this issue. Question: will concessions bring in local jobs? We don’t want to support it and not be able to utilize it. Response by Mr. Zacher: there will be opportunities for local food trucks, local beer, etc. Question: how will you preserve/honor the history of our neighborhood? Response by Mr. Zacher: I’d love to talk to you about your ideas. Question: long-term we’d all love a pedestrian bridge going over Jewell; in the meantime, the Evans bridge is used by people walking—is there any improvement planned for 2017? Response by Ms. Bowers: part of the transportation study is to look at safe pedestrian and bicycle crossings prior to any bridges; it could be something simple as paint and flashers. We want to look at connectivity for all different locations. Response by Mr. Robertson: We do have a separate pot of money for roadway connections around the park. Response by Mr. Zacher: the more successful a project like this is, the more eyes on it, and the more funding you can get. Question: how is clean up handled? Response by Mr. Zacher: we will have a cleanup crew that will clean up our space every night. That’s another opportunity for the neighborhood to get involved and potential employment. Question: curious where things are at and timeline for the pathway being built around the park? Response by Mr. Bouchard: spring/early summer depending on the weather. 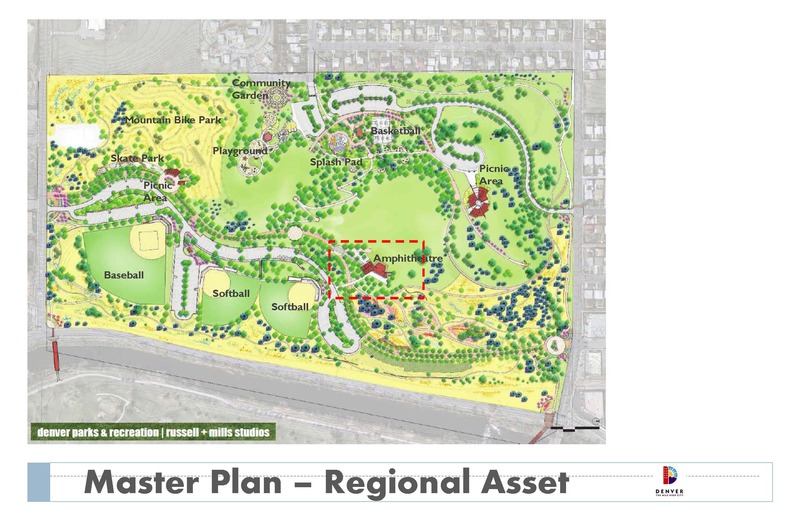 Response by Mr. Robertson: during input gathering for the master plan, we heard the loop trail was the #1 thing people wanted. It’s going to be a great, fun trail. Scott concluded the meeting by expressing excitement for the improvements happening in our neighborhood.